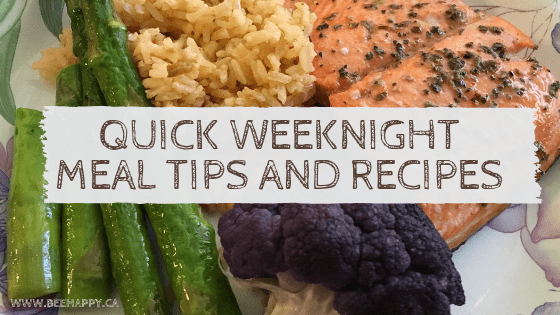 As I’m preparing to go back to work, I am dusting off the cobwebs for all my tricks and tips for weeknight meals for busy families. With two working parents and kids in daycare and school all day long, there will be no one at home to prepare dinner. This is one of the most challenging aspects for me going back to working outside the home. There is literally not enough time to quickly prepare and eat dinner without the right plan for your family’s weeknight meals. No more winging it, I am stocking up the freezer and prepping ahead of time. Luckily I’ve done this before and I’m definitely up to the challenge. As I’m going through the process of preparing and researching and stuffing chopped veggies into freezer bags, I want to share my best tips and links to favourite recipes for quick weeknight meals for busy families. The main thing to keep in mind about these is to make sure that the cooking time will still fit into your schedule. It’s all nice and good to have a frozen lasagna waiting for you, but if it needs an hour in the oven, it won’t really work as a quick weeknight meal. This might mean having things that you can bake the night before and only reheat the day of (most casseroles reheat well). Slow cooker freezer meals are my favourite because they cook while I’m at work. Or simply remembering to defrost the dish ahead of time will significantly cut down on cooking time. Meatballs, ravioli and tortellini, pizza, sausages, are all very freezer friendly and can be cooked quickly on a busy weekday. Fried Rice – I never would have thought to cook this ahead of time and freeze, but it works! Sixteen Freezer Crockpot Dinners – I highly recommend the coconut chicken curry! Check out this great guide to which cooked foods can be frozen. You need a repertoire of quick and easy dishes that use simple every day ingredients that you’re likely to have on hand. I have a few go to meals that literally take 15 minutes or less to cook. Aside from the pre-made freezer items mentioned above, these recipes are quick, easy and delicious. Korean Beef Bowl – I add shredded carrots and/or mushrooms for more veggies. You can sub the ground beef for cubed chicken thighs as well. Parmesan Crusted Tilapia Fillets – This recipe is so quick. You can prep the filets with the parmesan coating ahead of time and just put them in the preaheated oven. It is really delicious and even if your family isn’t a fan of fish (mine aren’t), they’ll love it. This Parmesan coating works well on catfish as well as chicken breasts (though the chicken would take longer to bake). One Pot Garlic Parmesan Pasta – This is a spin on a fettuccini Alfredo. I make this with different pastas, like penne and I add mushrooms, spinach and chicken. My whole family loves this dish and we eat it about once a week. Lemon Garlic Shrimp Pasta – If you cook the pasta ahead of time, this is a really quick recipe. I like to add tomatoes as well. Stir Fry – This is such a versatile dish, you can make it with noddles or over rice, as a freezer meal or with fresh ingredients. With chicken, sausage, beef, shrimp… The possibilities are endless. Do you have a super fast recipe to add? Please leave a comment, I’m always searching for more ideas! Chicken soup – I use this chicken soup with dill recipe in the slow cooker (8-9hrs on low) and usually sub in 4-5 chicken drumsticks instead a whole chicken. Using chicken drumsticks for soup is actually very convenient when you don’t have a lot of time. You keep the bones and skin which add to the richness of the broth in the soup, and you don’t have to waste time fishing the chicken carcass out of the soup when it’s done. Plus drumsticks can be really inexpensive, especially if bought frozen. This soup also freezes really well if you have the freezer room. Personally I like carrots and potatoes as the root veggies in it. Spicy Chili from Michael Smith – This recipe is a starting point for me. I cook it in the slow cooker on low for 9-10hrs. Cook the bacon the night before (you can do it in the oven, no mess!). I don’t add this much spice to mine because I want the kids to eat it. Serve topped with sour cream, cheese and green onions. Corn and Potato Chowder – I love this recipe, it’s very yummy and doesn’t require much prep. I recommend adding 1 red bell pepper, chopped. Sprinkle a bit of smoked paprika on top when serving. If you’re not familiar with Damn Delicious, definitely take your time browsing the recipes. A lot of my regular go-tos come from this site. Slow Cooker Mongolian Beef – This is ridiculously easy and delicious. Add 2-3 cups of broccoli florets into the slow cooker 20-30 minutes before serving to have more veggies in the dish. Or serve steamed broccoli on the side. Serve over rice. Chop onions, garlic, ginger ahead of time and freeze. Or buy onion, garlic or ginger powder. Personally I don’t like the minced garlic or ginger jars sold in stores because they’re usually pickled and the taste isn’t the same. Separate and chop meat as soon as you buy it into portions ready to use. This requires some meal planning ahead of time. Take advantage of prepped ingredients when grocery shopping: broccoli florets, pre-washed spinach, shredded carrots are huge time savers. Cook pasta or rice ahead of time – A lot of the recipes I mentioned can be served over rice. Rice doesn’t take that long to make, but you can definitely make it ahead of time as well. I also have a programmable rice cooker that will make rice while I’m at work. I highly recommend that.